Believe it or not, there are gender preferences for fruit producing trees! 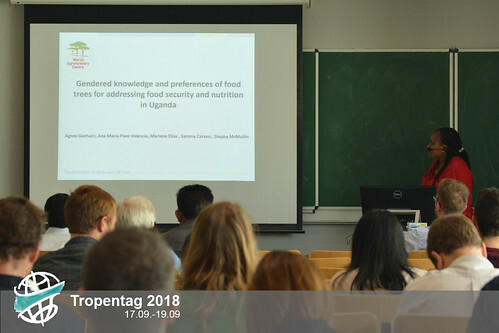 This is what Agnes Gachuri, from the World Agroforestry Center (ICRAF), presented in one of the oral presentation sessions at Tropentag 2018. It is known that the fruit producing trees have an important role in rural livelihoods and food security. But when it comes to which kind of trees to cultivate, the farmers have to make a decision. They are the ones that have local knowledge and prioritize the species cultivation, as well as household use. However, sometimes farmers fail to consider the potential of local varieties due to market demand, lack of seed availability, or knowledge transfer.